Reference the device owner's manual for verification. The handheld transmitter appears to program the HomeLink® Universal Transceiver but does not activate the device. Press and hold the trained HomeLink button. The device has the rolling code feature if the indicator light flashes rapidly and then turns solid after 2 seconds. 1. At the garage door opener receiver (motor-head unit) in the garage, locate the "learn" or "smart" button. This can usually be found where the hanging antenna wire is attached to the motor-head unit. Exact location and color of the button may vary by garage door opener brand. If there is difficulty locating the training button, reference the device owner's manual or please visit our Web site at www.homelink.com. 2. Firmly press and release the "learn" or "smart" button (which activates the "training light"). There are 30 seconds in which to initiate step3. 4. Press and hold the just-trained HomeLink® button and observe the red Status Indicator LED. If the indicator light stays on constantly, programming is complete and your device should activate. 5. To program the remaining two HomeLink® buttons, follow either steps 1 through 4 above for other Rolling Code devices or steps 2 through 5 in Standard Programming for standard devices. During programming, your handheld transmitter may automatically stop transmitting. Continue to press the Integrated HomeLink® Wireless Control System button (note steps 2 through 4 in the Standard Programming portion of this document) while you press and re-press ("cycle") your handheld transmitter every two seconds until the frequency signal has been learned. The indicator light will flash slowly and then rapidly after several seconds upon successful training. To operate, simply press and release the programmed HomeLink® button. Activation will now occur for the trained device (i.e. garage door opener, gate operator, security system, entry door lock, home/office lighting, etc.). For convenience, the hand-held transmitter of the device may also be used at any time. 1. Press and hold the desired HomeLink® button. Do NOT release until step 4 has been completed. 2. When the indicator light begins to flash slowly (after 20 seconds), position the handheld transmitter 1 to 3 inches away from the HomeLink® surface. 3. Press and hold the handheld transmitter button. The HomeLink® indicator light will flash, first slowly and then rapidly. 4. When the indicator light begins to flash rapidly, release both buttons. 5. Press and hold the just-trained HomeLink® button and observe the red Status Indicator LED. If the indicator light stays on constantly, programming is complete and your new device should activate. 1. Press and hold the two outer HomeLink® buttons until the indicator light begins to flash-after 20 seconds. 2. Release both buttons. Do not hold for longer than 30 seconds. The Integrated HomeLink® Wireless Control System is now in the training (learn) mode and can be programmed at any time following the appropriate steps in the Programming sections above. The transceiver has been tested and complies with FCC and Industry Canada rules. Changes or modifications not expressly approved by the party responsible for compliance could void the user's authority to operate the device. NVS® is a registered trademark and Z-Nav™ is a trademark of the Gentex Corporation, Zeeland, Michigan. HomeLink® is a registered trademark owned by Johnson Controls, Incorporated, Milwaukee, Wisconsin. Your vehicle may be equipped with a Gentex Automatic-Dimming Mirror with a Z-Nav™ Electronic Compass Display and an Integrated HomeLink® Wireless Control System. During nighttime driving, this feature will automatically detect and reduce rearview mirror glare while the compass indicates the direction the vehicle is pointed. The HomeLink® Universal Transceiver allows you to activate your garage door(s), electric gate, home lighting, etc. The NVS® Mirror automatically reduces glare during driving conditions based upon light levels monitored in front of the vehicle and from the rear of the vehicle. These light sensors are visible through openings in the front and rear of the mirror case. Any object that obstructs either light sensor will degrade the automatic dimming control feature. 1. Pressing and hold the button for 3 seconds turns the autodimming function OFF which is indicated by the green Status Indicator LED turning off. 2. Pressing and hold the button for 3 seconds again turns the autodimming function ON which is indicated by the green Status Indicator LED turning on. 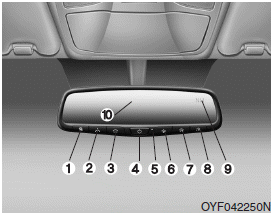 The mirror defaults to the ON position each time the vehicle is started. The NVS™ Mirror in your vehicle is also equipped with a Z-Nav™ Compass that shows the vehicle Compass heading in the Display Window using the 8 basic cardinal headings (N, NE, E, SE, etc. ).